Anyone know of a list of keyboard Shortcut Commands or how to set them up? If you go into Edit > Customize > Actions, they are all listed there, and you can change them by using the right-click menu. Just copy the contents of the code block above, paste it into a new text document in your favorite text editor and save it to a file named "Keyboard Shortcuts.dsa". Then, depending on where you save it, you can launch the script via drag-n-drop onto the viewport, double click from within the Content Library pane, a Custom Action in the Main Menu Bar or a Toolbar, etc. Thanks Rob, that is a very useful script. I put it in my Scripts folder in Documents, and it works great. It is a very handy way to learn new shortcuts too, many thanks. aNY IDEA HOW THAT WORKS WITH 4.6? Rob's script doesn't show keyboard accelerators assigned to user made custom commands. Here's a version that does. It also changes from a listbox to an edit box so you can copy the text out. That Script works great, thank you very much! Ah, so it is. I've been looking for this. 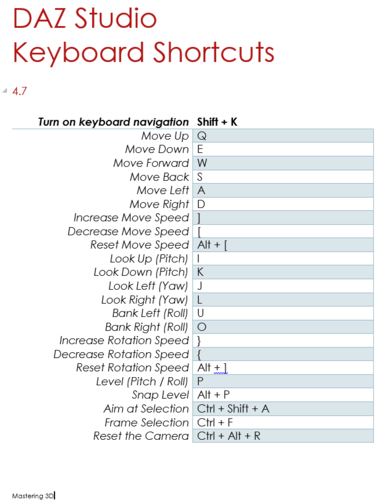 By chance, has anyone made an actual list of these keyboard shortcuts, such as could be printed out on paper? I made this table of keyboard shortcuts. Hope it helps. I noticed those are all camera shortcuts. aren't there hotkeys for Twist, Bend, and Front-Back somewhere? would speed up my work significantly not having to drag on the dials every time. Keep your eye on http://docs.daz3d.com/doku.php/public/software/dazstudio/4/referenceguide/scripting/api_reference/samples/start - your question apparently chimed with soemthign Rob has been thinking about and - time and the effectiveness of the result depending - he may be able to post a sample script showing how to emulate a key-driven modification (like the WASD navigation options). It probably won't be exactly what you want, but it should show the steps and functions required.